**Check out some of OO&B’s herbs and spices! Preheat the oven to 350°F. Spray a 1-1/2-quart baking dish with nonstick spray. Boil the green beans in the chicken broth for about 20 minutes, and then drain, reserving 1-1/2 cups of the chicken broth. Meanwhile, mix together the breadcrumbs, Parmesan, and 2 teaspoons of the oil in a small bowl. Set aside. Heat the remaining 1 tablespoon oil in a large skillet over medium heat. Saute the onions until translucent, 2 to 3 minutes, and then add the mushrooms and continue to cook for 3 to 4 minutes longer. Remove from the heat. Pour the reserved 1-1/2 cups chicken broth back into the pot that the green beans boiled in, and bring to a boil. Add the green beans to the skillet with the mushrooms and onions. While that is coming to a boil, combine the cornstarch and 1/4 cup water in a small bowl to make a slurry. Slowly pour the slurry into the boiling broth, whisking constantly as it thickens, about 2 minutes. 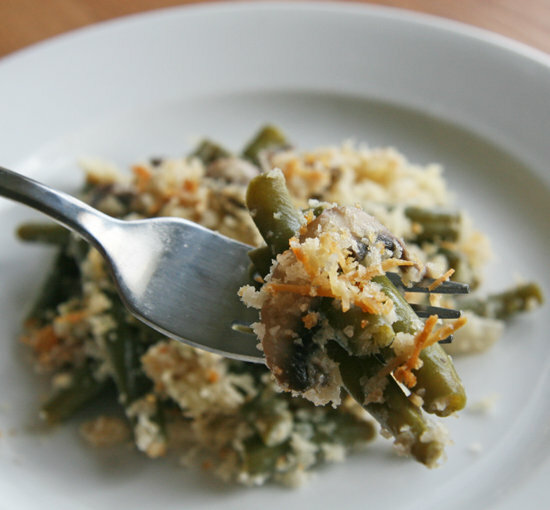 Pour the thickened mixture over the green beans, mushrooms, and onions. Add the sour cream, house seasoning, and salt. Stir well. Pour into the baking dish and sprinkle with the panko-and-cheese mixture. Bake until the casserole is hot, about 10 minutes, and then broil until the breadcrumb topping is slightly browned, 1 to 2 minutes.